The Civil Society Election Coalition (CSEC) 2011 deployed approximately 9,000 trained and accredited non-partisan monitors to polling streams for the 2011 Tripartite Elections. CSEC wishes to commend Zambians for going out and voting in large numbers. We also wish to acknowledge the efforts of the polling officials who were in charge of the more than 9,000 polling streams to provide Zambian with an opportunity to vote. Based on reports from our monitors in every province, district and constituency of the country, CSEC notes that so far the election process, while not perfect, has been generally smooth and peaceful. The election, however, is not over. Any election day has five main processes: 1) the setting up of polling streams; 2) voting; 3) closing of polling streams; 4) counting; and 5) the collation and announcement of results. Vigilance must continue to help ensure the credibility of the collation and announcement of results. 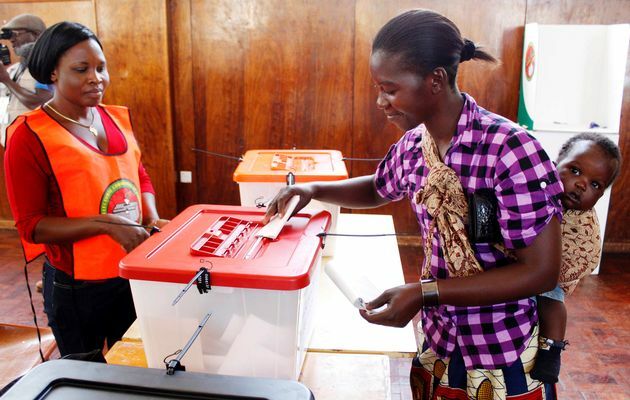 The Civil Society Election Coalition (CSEC) 2011 is a joint initiative of eight independent and non-partisan Zambian organisations which have come together to monitor the 2011 Tripartite Elections together. CSEC’s mission is to help ensure that all Zambians are able to exercise their right to vote and to provide the people of Zambia, political contestants and the Electoral Commission of Zambia (ECZ) with independent non-partisan information on the electoral process. This is done to help enhance the credibility of the process and to promote peace in the country. The member organisations and the thousands of volunteer monitors are all committed to carrying out their mission in accordance with the Laws of Zambia and the Electoral Code of Conduct as well as regional and international standards. On Election Day, CSEC deployed approximately 9,000 trained and accredited non-partisan monitors to nearly every polling stream and station in the country. All CSEC monitors signed a Non-Partisan Pledge in addition to agreeing to adhere to the ECZ’s Code of Conduct. These monitors, clearly identifiable by their t-shirts, were there to give voters confidence to participate in the election process. Among CSEC’s monitors, 985 were designated as Rapid Response Project (RRP) monitors to provide more immediate information on the conduct of the election. They were deployed to polling streams at a representative sample of polling stations located in every province, district and constituency of the country. It is primarily reports from these observers that form the basis of this preliminary statement. This preliminary statement is being shared with the people of Zambia, political contestants and the ECZ in order to enhance the transparency and credibility of the process and to give an overall national civil society picture of the election. Transparency is the hallmark of any credible election process. We commend ECZ for its efforts to reach out to all stakeholders through several consultative meetings to discuss electoral preparations and issue of mutual concern. ECZ staff served as part of the resource persons for trainings of CSEC monitors. These efforts by the ECZ helped build confidence in the electoral process even before Election Day. Accreditation of polling agents, monitors/observers and journalists is important so that only authorised individuals have access to polling stations on Election Day. CSEC appreciates the decision by the ECZ to decentralise accreditation to the district level. However, there seems not to have been sufficient orientation to ECZ officials on the new procedures which resulted in some cases monitors experience difficulties in accrediting. Article 20 of the Constitution protects the freedom of expression for all Zambians. This was an important reform of the Third Republic and the right to free speech should be jealously defended by all Zambians. However, some campaigns (from across the political spectrum) have exploited this right and engaged in hate speech and character assassination. The pre-election period was marred by incidents of political violence and intimidation. We are all Zambians and every Zambian, regardless of his/her political beliefs, has the right to participate in politics as a candidate and a voter. This right of association is enshrined in the Universal Declaration of Human Rights and the Constitution. The bitter rhetoric that characterised much of the campaign has heightened political tensions unnecessarily and has contributed to incidents of intimidation and violence during the pre-election period as well as undermined public confidence in the electoral process. The Constitution, Electoral Act and other legislation provide the legal framework upon which any election is based. The legal framework should be consistent with international and regional standards and commitments as well as perceived as legitimate by the vast majority of citizens across the political spectrum. Prior to the 2011 Tripartite Elections, there was serious debate over constitutional reform – including discussions over the elements of the electoral framework. This process culminated in the National Constitutional Conference (NCC) and the tabling of a new draft Constitution in the National Assembly – which was ultimately not adopted. The inability to find consensus can have the potential to affect of the electoral framework. Generally, the setting up of polling streams across the country went well, but there were limited problems of polling streams opening late due to the late delivery of materials. Given the political climate in the country, this led in several incidents to violence. As of 06:00 hours 65% of polling streams across the country had opened on time. However, 30% of polling streams opened between 06:00 and 07:00 hours and 3% of polling streams opened between 07:00 and 09:00 hours. Just 1% of polling stations opened after 09:00. Late opening of polling streams was more of a problem in Lusaka and North Western provinces where only 40% and 48% of polling streams respectively were open by 06:00 hours. These delays in opening of polling streams were generally due to the late delivery of materials. ü 99% of polling streams had one or more polling booth (where voters could mark their ballots in secret). ü At 97% of polling stations uniformed security personnel were present. Finally, 99% polling streams were set up in a manner that allowed voters to mark their ballot papers in secret and at 100% of polling streams all of the ballot boxes were shown to be empty before being closed and sealed. Generally, voters across the country had an opportunity to vote, but problems remain where the voters registers in some instances did not have the names of eligible voters with National Registration Cards (NRCs) and Voter’s Cards. Also, while the environment during voting was generally calm there were some incidents of violence and intimidation. While these did not largely affect the overall process, there is no place for such behaviour in a democratic election. ü At 95% of polling streams every voter was marked with indelible ink. ü At 2% of polling streams the voting process was suspended for 30 minutes or more. The closing process generally went well with few voters still in the queue at closing time. ü At 91% of polling streams the opening slots on all of the ballot boxes were sealed and closed after everyone had finished voting. The counting process across the country generally went well with only a few disagreements over the official count, but at some polling station not all polling agents received copies of the official results. ü At 94% of polling stations the official results were posted for the public to see. Critical incidents are those events witnessed by CSEC monitors that could fundamentally undermine the integrity of the process at a particular polling stream. All CSEC monitors were provided with Critical Incident Forms for use in the event they witness a serious problem and a national hotline was set up so that our monitors could immediately report any such incidents to the CSEC leadership. After being reviewed, information on critical incidents was reported, as appropriate, to the ECZ and/or the police so that action could immediately be taken to address these problems. A total of 187 critical incident reports were filed by CSEC monitors from across the country. Incidents of violence were reported in Central, Copperbelt, Luapula, Lusaka, Northern and Western provinces. The highest number of violent incidents was reported in Lusaka Province with 10 cases. Incidents during polling at stations in Lusaka such as Lilanda Basic School (in Matero constituency) and Twashuka Basic School (in Kanyama constituency) led to the suspension of the polling process for several hours. In both cases violence was a result of late delivery of election materials and public suspicion that this was evidence of manipulation of the process by political parties. With regards to problems of accreditation, polling officials required monitors to produce additional supporting documents such as a letter from ECZ or reject monitor accreditation badges because they lacked a picture (neither of which was a requirement). Incidents of monitors being denied entry to polling stations were reported in Central, Copperbelt, Luapula, Lusaka, North Western, Southern and Western provinces. CSEC would like to commend the timely intervention of ECZ to correct such inconsistency in the application of procedures to access polling stations by domestic monitors. Ultimately, all CSEC monitors were able to gain access to polling streams. However, the overall number of critical incidents was relatively few across the country and did not fundamentally undermine the credibility of the overall process. Again, based on reports from our monitors in every province, district and constituency of the country, CSEC notes that so far the election process, while not perfect, has been generally smooth and peaceful. Vigilance must continue to help ensure the credibility of the collation and announcement of results. CSEC monitors are still at constituency collation centres across the country as well as at Mulungushi Conference Centre in Lusaka observing the results collation process and CSEC will issue additional statements on the process as warranted. CSEC will continue to conduct its activities in accordance with the Laws of Zambia and the ECZ’s Code of Conduct and to provide the ECZ, political contestants and the people of Zambia with impartial and independent information on the conduct of the 2011 Tripartite Elections. In order to provide even greater transparency and help ensure acceptance of the results by all political contestants, CSEC encourages the ECZ to go beyond its past practice and publicly release in Lusaka (at the Mulungushi Conference Centre and on the Internet) the official polling station-level results for each of the 6,454 polling stations. While not required, such an extraordinary step on the part of the ECZ would enable the thousands of polling agents who have been given official copies of the polling station results to compare their figures not only with what is announced at the constituency collation centres, but ultimately by the ECZ in Lusaka and will leave no doubt that the official results as collated by the ECZ reflect the ballots cast by voters across the country. Finally, the entire CSEC Steering Committee calls on all political leaders, their supporters and the public in general to remain calm and peaceful as the ECZ collates the final results. This is a difficult time as the fates of the candidates hang in the balance. However, Zambia is a peaceful nation and led the way in southern Africa in regards to multiparty elections. Again, we thank the voters for turning out and participating in the democratic process and to the ECZ officials who managed the more than 9,000 polling streams across the country.